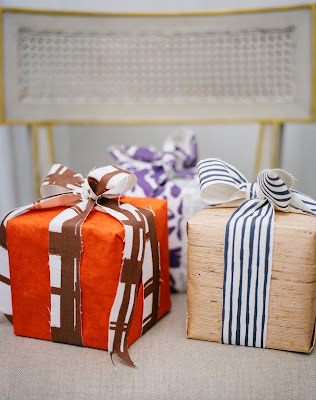 Even if it feels way too early to start thinking about holiday gift wrap, it's not too early to start saving scraps if you plan to use recycled materials. 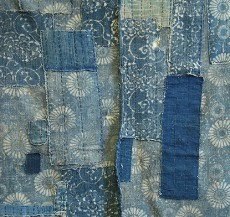 Last year Michelle Adams used scraps of her own Rubie Green fabrics for ribbons. I love the idea of the brown and orange for a fall birthday. Photograph courtesy Patrick Cline. 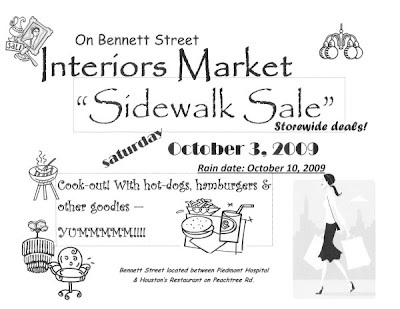 This Saturday, October 3rd, Interiors Market hosts a sidewalk sale at its Atlanta location on Bennett Street (between Piedmont Hospital and Houston's restaurant on Peachtree Road). 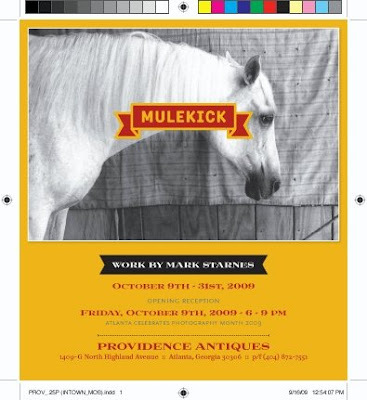 Also in Atlanta on Friday, October 9th from 6 to 9 p.m., Providence Antiques hosts a reception for photographer Mark Starnes. 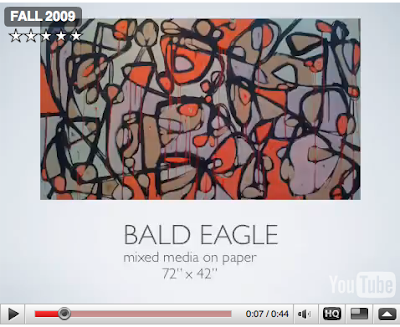 His work will be on view there throughout the month. 1409 North Highland Avenue. In April, when I did a series of posts on handmade gifts, there was a brief mention of Amanda Talley's four-hour disc mix compiled for Art for Arts' Sake. The positive response to it has inspired a new fall series of iMixes from guest contributors. First up, naturally, is Amanda. 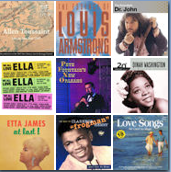 I asked her for a mix that would work for Sunday brunch and she came up with a jazz-inflected compilation appropriate for a multi-generational gathering. And even though a brunch was the original idea, I think this mix is also really nice to listen to alone while doing a Sunday morning project. All of the songs below are available through iTunes. Here's a direct link to the whole mix. 1. Ella Fitzgerald and Stevie Wonder "The Sunshine of My Life"
2. Louis Armstrong "All of Me"
3. Terence Blanchard "Ghost of Congo Square"
4. Nina Simone "My Baby Don't Care for Me"
5. Dr. John "Such a Night"
6. Pete Fountain "Do you know What it Means to Miss New Orleans"
7. Allen Toussaint (live at JazzFest) "Southern Nights"
8. Clarence "Frogman" Henry "Ain't got no Home"
9. Dinah Washington "Baby you Got What it Takes"
10. Etta James "Sunday Kind of Love"
11. Phil Phillips "Sea of Love"
CD label art by Amanda Talley; for more inspiration, visit The Big Easy Life. The image at top is via Gourmet; photo by Mikkel Vang. Click here for Scott Peacock's pimento cheese toast recipe. Bloody Mary photograph by Marian Cooper Cairns for Southern Living. Click here for the recipe. 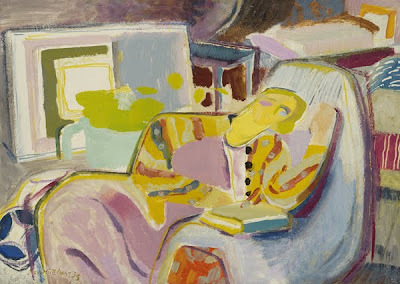 I keep seeing iconic British modernist Ivon Hitchens in art world news. 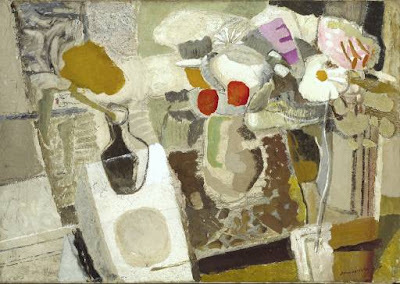 Already popular with collectors, the painter who lived from 1893-1979 is generating buzz because 24 of his previously unknown works from the 1930s were recently uncovered by gallerist Jonathan Clark. The paintings are now on view at the London gallery through October 10th. In a review for the Financial Times, Clark describes Hitchens as the most sensuous, spontaneous and laid-back of the English modernists. 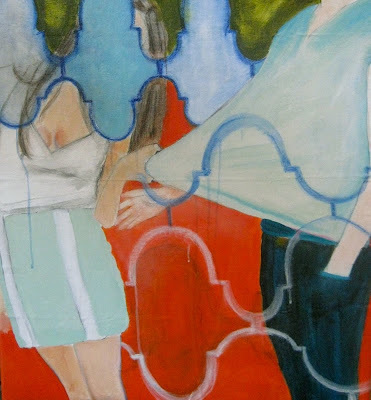 Shifting to the 21st century, Hayley Gaberlavage just added to her website a group of new paintings and drawings including smaller more affordable works on paper. 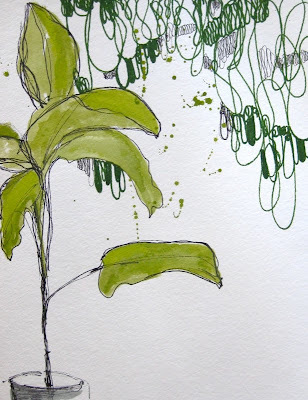 The watercolor above, Banana Tree, is sold but be sure to check out her other pieces. Over the past few weeks we've been checking in with interior designer Angie Hranowsky as she finished her work on Coastal Living's 2009 Idea Cottage in I'On. Now a detailed video tour is up on Coastal Living's site, and all of Angie's designs are highlighted in the October issue. Her unfussy use of lilac in the master bedroom is kind of breathtaking. I rarely use that dramatic description, but the bedroom is really sensational. 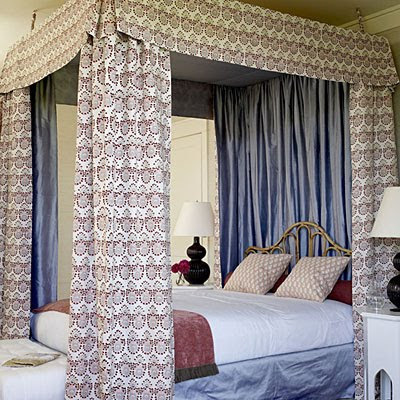 And, yes, she used John Robshaw fabric for the canopy. (More specifics are available in the new issue.) 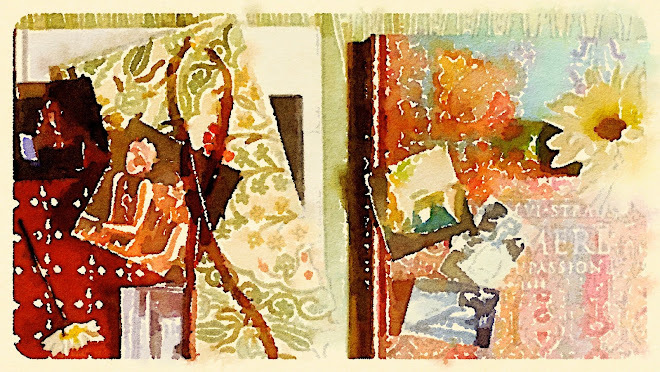 A few details about the original art Angie selected for the rooms can be found here. Background on her collecting style is here. I think I spotted a PerlaAnne linocut in one of the bathrooms. 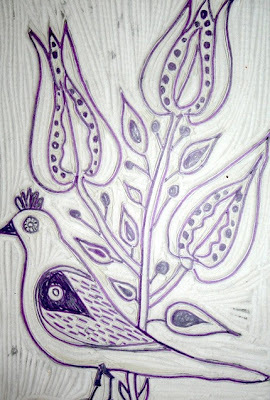 The images below show one of printmaker Stacey Bradley's handcarved blocks along with a finished print. The showstopper in the house is Molly B. Right's portrait in the dining room, shown below. 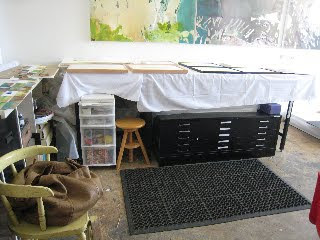 Other artists include: Julia Lynn, Sally Benedict, Amanda Talley and Kate Long Stevenson. I love the new video Amanda has added to her own site. Click here to watch. 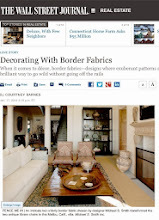 Credit for first picture: Photographer Tria Giovan, Stylist Lindsey Ellis Beatty, image courtesy Coastal Living. 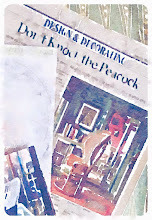 The editors of Canadian House & Home gave me a fun challenge: choose ten favorite design elements. It's always incredibly hard to narrow the field of great ideas out there, but I had a good time pouring over pictures from the past year and beyond. 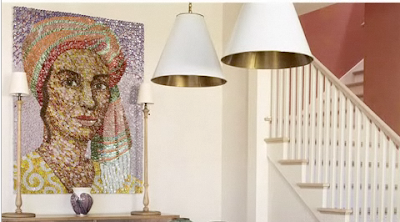 For example, I realized that Betsy Burnham was way ahead of the curve during the early-to-mid-2000s with her Sherwin Williams "Needlepoint Navy" walls. 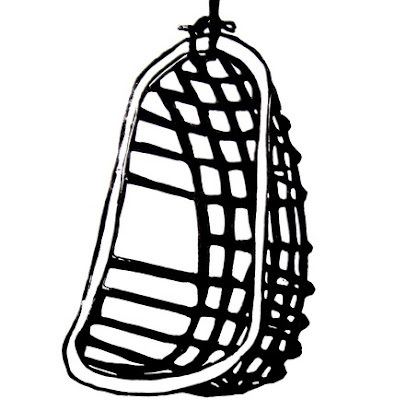 And Grant Gibson really is the go-to man for chic-yet-practical storage solutions. FYI: Talented Michael Penney's teriffic home is featured today in a wonderful H & H slideshow. I love his alternative to the expected kitchen island. Check it out here. 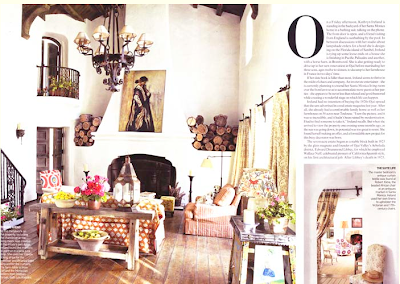 Image at top, Betsy Burnham design photographed by Lisa Romerein. Second picture also courtesy Betsy, and third image courtesy Grant Gibson. The other day in Anthropologie, I stumbled upon a life-size ostrich crafted mainly with coarse rolls and rough strips of paper. 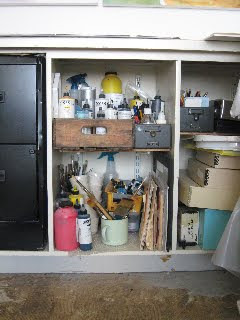 Intrigued, I began researching paper crafts and paper sculpture. A vast subject, no question. 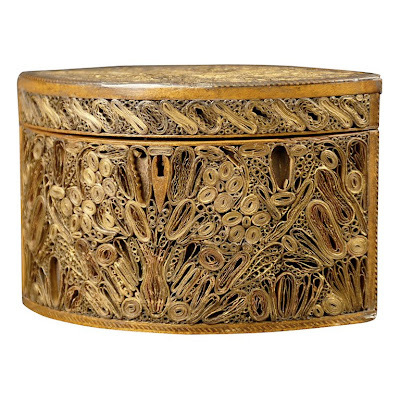 But there is one intricate piece I have to single out: a George III rolled paper tea caddy, circa 1780, from William Word in Atlanta. Doesn't it look a bit like it could be contemporary? 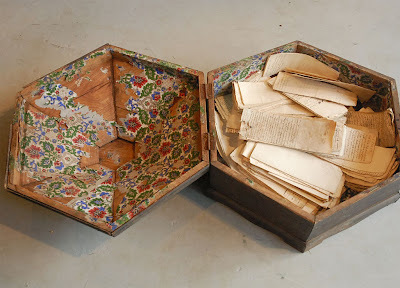 Actually, paper filigree crafts were immensely popular two and three hundred years ago. In 1988 the New York Times ran a story explaining that during the 18th century shops across Britain sold women how-to instructions along with the myriad multi-color papers needed to complete a project. The example above is exceptional with painted and gilt hand-rolled scrolls. 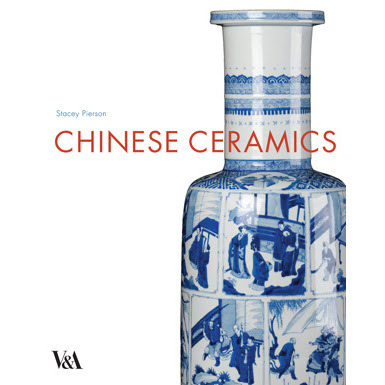 One of the V & A's latest titles, Chinese Ceramics by Stacey Pierson, looks like a good essential for the design library. In addition to the iconic pieces we expect to see such as Ming vases, celadons, and famille rose, this book also covers 20th and 21st century ceramics including propaganda ware and studio pottery. Related past post: Mary Delany. And not the magazine or the book. "Dominos," or domino papers, might be described as the ancestors of proper European wallpaper. These small wood-block-printed paper sheets measured approximately 20 by 14 inches and were made by French craftsmen as early as 1401, explains Carolle Thibaut-Pomerantz in her lavishly illustrated new book, Wallpaper: A History of Style and Trends. Using a brush or stencil, master domino makers often hand painted color over their original printed design. In the beginning, dominos were used for bookbinding, to cover fireplace screens, and to line the interiors of boxes and chests. But ultimately they became popular as affordable, highly decorative wallcovering. Dominoterie are just a small part of the interesting territory Thibaut-Pomerantz explores in Wallpaper. Her book could become one of the most blogged about volumes this season because it is such a definitive source. 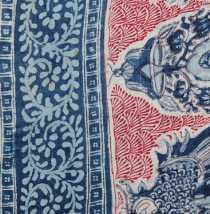 It's sort of a given that interior designers will appreciate being able to see in one place the entire evolution of wallpaper, from early dominos to lush scenic 18th-century papers to cutting edge 20th-century designs. The surprise is how appealing the tactile book may be to painters, printmakers and anyone interested in the history of paper and design in general. Look for it to be in book shops this October. The domino encrusted tray shown at top is from JED, one of Mrs. Blandings' favorite shops, and the Spanish Colonial wooden box lined with decorative paper is from Voila! 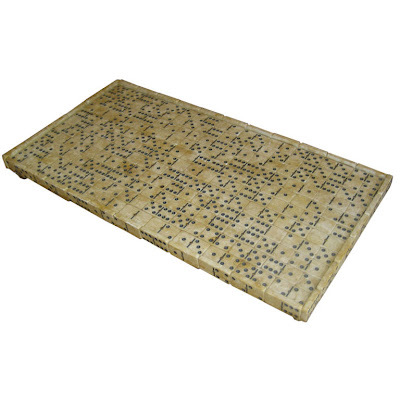 The latter is not as old as the domino-lined pieces discussed in the book but is used here simply as a similar example. In the publishing world, books about houses often fall in one of two categories: Fantasy or "aspirational," meaning the featured homes are unattainable for most readers but nonetheless satisfying for daydreaming, and "how to" guides that provide readers concrete steps to use in decorating their own rooms. 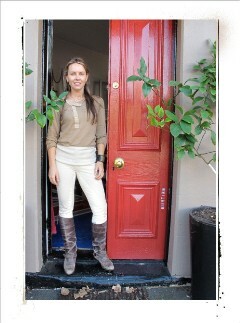 Kathryn Ireland's new book, Creating a Home, appeals to me because it combines fantasy and reality. 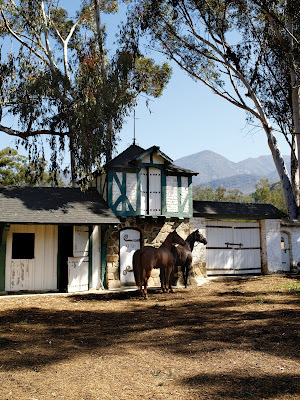 Not many of us have the opportunity to restore a 1920s Wallace Neff–designed California dairy barn and stables (in fact, Ireland writes that quite a few architecture-obsessed actors with deeper pockets than hers had walked away from the estate sensing it was a money pit). 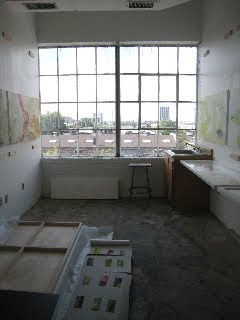 But I think architecture buffs of all kinds will find the project inspiring. The Libbey Ranch, as the estate is known, has had several lives; Neff originally designed a collection of buildings to house animals, and then in the 30s Austen Pierpont was brought in by a new owner to re-imagine the barn and outbuildings as a residential holiday compound. So, the place has always had a certain whimsy. Ireland is also candid about the financial pitfalls of any restoration, and she talks about striking the balance between modern comfort and historic authenticity. The interiors are restrained, reflecting Vogue's four essential ingredients for a welcoming home: personal warmth, sincerity, understatement, and consideration. For one thing, the decoration doesn't upstage the occupants. Ireland says her goal was to make the large living room equally inviting for a crowd or for one person in need of a nap. And although the place has a wonderful rustic vibe, it doesn't feel like a movie set version of a ranch. It's not theatrical. The art ranges from old to contemporary; from flea market finds to works by India Jane Birley (a childhood friend and granddaughter of portrait painter Sir Oswald Birley) and by Oberto Gigli. All of it seems to be there because Ireland loves it, not for its pedigree. Another aspect that might contribute to the home's welcoming quality is the balance between masculine and feminine elements. 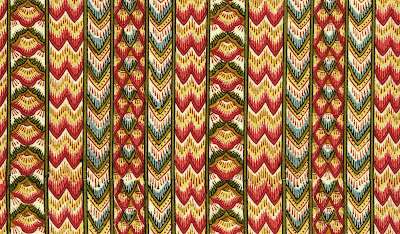 The sturdy beams and abundance of old-growth wood are nice foils for Ireland's highly decoritive fabrics. While I imagine that the architectural restoration cost a small fortune, the furnishings fly in the face of trendy, living-above-your-means decor. All of the pieces are the sort that never really go out of style. There is something refreshingly frugal about that. Click all images above to enjoy the details. Just to refresh your memory of the American Vogue Living spread from 2007 that piqued everyone's interest. Photography by Thibault Jeanson. Ireland and Vogue's Editor at Large, Hamish Bowles, have an affinity for some of the same artists including Konstantin Kakanias and Sir Oswald Birley. 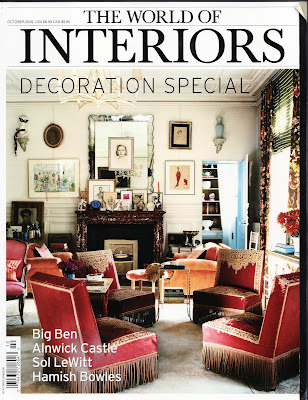 Bowles' apartment is on the cover of World of Interiors, October 2009; to the right of his fireplace hangs Kakanias' "Mrs. Tependris at Home." 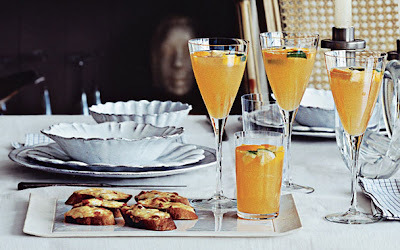 Photography by Francois Halard. Click to enlarge. 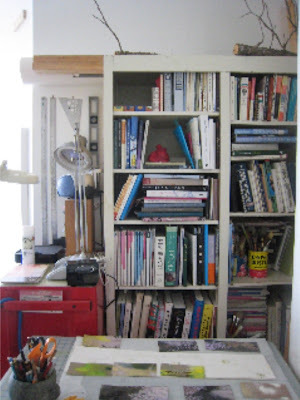 I know a lot of you have been curious to see what sort of studio Annie Butrus works in. The other day she paused to snap a few candid shots in her light-filled Alabama space. 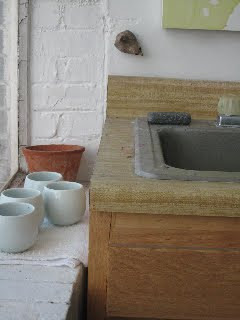 Like other artists, she keeps tools in a favorite cup that has been with her since college. Annie says hers is from the Wellesley bronze foundry where she spent many hours. Clearly she references an array of books when she works too. 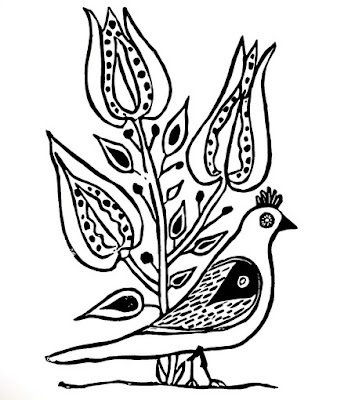 Textile designer Aleta Bartel-Orton, founder of a boutique fabric company that stocks her own designs as well as the largest online collection of block-printed fabrics by Brigitte Singh, is excited about some new Singh prints expected to debut in a few weeks. She sent me a sneak peek with the disclaimer that this image doesn't do justice to "Leila Stripe's" joyful, vibrant colors. Shown here is the pink colorway, and a second option in reds and greens will be available too. I'm crazy about the chevron motif. Reminds me of the old textiles featured in Hali, summer 2009. The collection is available to retail customers and I've found Aleta's shipping rates to be very fair. While we wait for the debut of Man Shops Globe, Sundance Channel's new television series, I thought you might enjoy a quick overview of the eight scheduled episodes. 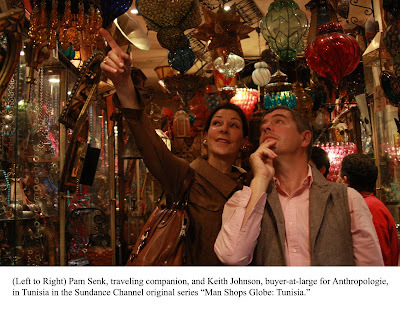 Each Wednesday night at 10 p.m., Anthropologie's buyer extraordinaire, Keith Johnson, will seek fresh finds in a different country. Things kick off October 7th when we can catch Keith in France on the hunt for affordable large-scale furniture to place in new shop locations set to open in the U.K., as well as in existing stores. Look for adventures in Paris and in Provence. During the second episode, we're along for the ride in South Africa. 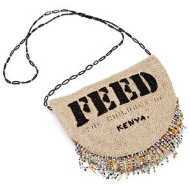 There Keith asks his African agent, Trevyn McGowan, to point him toward the unexpected; ceramics, roadside markets and high-end recycled design are among the things they explore. 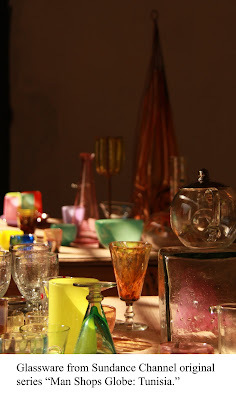 Other locations on the itinerary include Turkey (for textiles), Tunisia (where the team spots beautiful blown glass), the U.K., India, and Argentina. In Holland and Belgium, Keith brainstorms ways to interpret sleek Modernist décor for Anthropologie's devoted customers who often gravitate toward pretty, not-so-stark rooms. 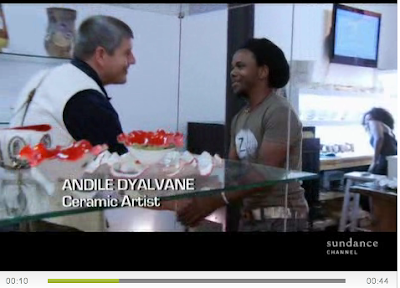 To learn about the artisans represented in the series, click here. The main page of the official website is here, and video clips of the artists are here. 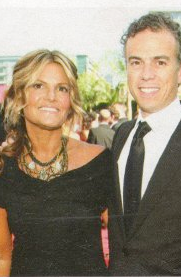 All images posted with permission from Sundance Channel and Anthropologie. Click the first three to enlarge and see the details. In the sidebar today I have a temporary link to a flood relief effort spearheaded by an Atlanta television station. 11 Alive has teamed up with The School Box to collect much needed school supplies for Clarkdale Elementary students who this week lost their school, and in some cases their homes, due to flooding. The news story I've linked to provides the essential facts, but I thought it might be helpful if I shared specifics in terms of the needed supplies. 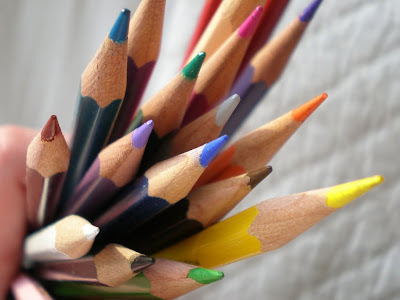 Helpful items include: rulers, notebook paper, children's scissors, crayons, pencils, notebooks, glue, and colored pencils. The drive continues through Sunday, September 27th and there are numerous drop off points listed here. 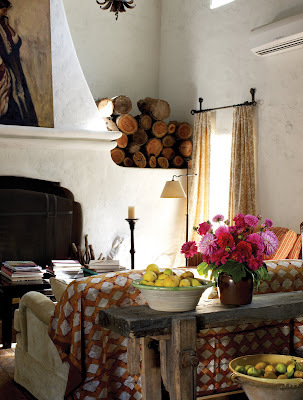 On the to-do list: spend a few leisurely hours pouring over Kathryn Ireland's new book, Creating a Home. 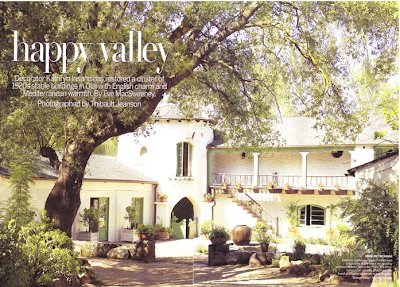 The designer's latest title highlights in detail her restoration of the Wallace Neff–designed Libbey Ranch in Ojai, California. 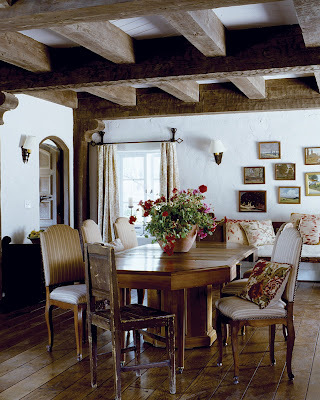 I think many design enthusiasts and Ireland fans really fell for the house and stables when the estate was photographed by Thibault Jeanson for Vogue Living, 2007. Now, with the release of the book, we get to see the home from many more beautiful angles, gain an in-depth understanding of Ireland's inspiration, and learn the history of Neff's project. 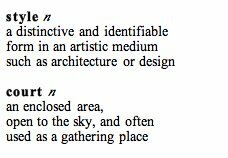 Because the ranch is often described as representing down-to-earth grandeur, I've been thinking a lot about the welcoming quality seen in all of Ireland's work. 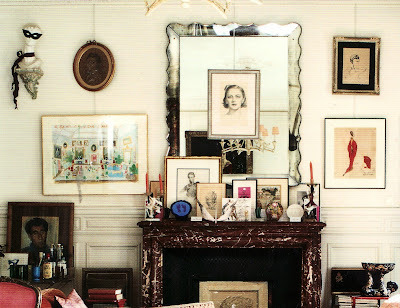 Her rooms seem simpatico with everything late-1960s Vogue editors recommended for gracious living -- their approach to creating a home. There must be a blog post in that somewhere. So, I'm off to hit the books, comparing Vogue's vintage criteria for a well-mannered home with every attribute of the Libbey Ranch. Be back soon with a peek inside.